Sandwich Village is brimming with history. The house that is now our bed and breakfast, built in 1750, is now 264 years old. It is a little younger than the Town, but has stood watch over much of the history we have celebrated during this 375 Anniversary year. Sandwich is the oldest town on Cape Cod and we tell our guest that it took the Pilgrims, who settled Plymouth in 1620, only 19 years to travel the 20 or so miles between the two towns. I know tourist crossing the Sagamore Bridge on a Friday night in the summer complain about how slow it can be on Route 3, but it is obviously much faster than the 1630’s modes of transportation. Sandwich proudly wears its history. A stroll around the Village gives a flowing documentation of the history of the growth of the town over the centuries. Our house and many of our neighbors have a white oval Historical Marker created by the Sandwich Historical Commission. The Marker identifies the original owner or builder of the house and the year built. All historic homes in Sandwich Village were invited to participate in the Marker program and most have. 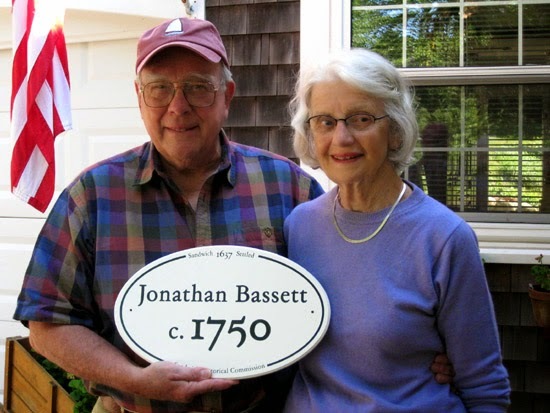 In our case, the Marker shows Jonathon Bassett as the builder and original owner, and the year 1750. Put and Peggy Brodsky are shown in this photo holding our historic marker. Peggy is the daughter of Robert and Margaret Morse who were the second family to own 118 Tupper Road which they purchased in 1929. We have been blessed to have them as quests at our inn many times. They have been the source of much of the historic information we have about the house. A short walk up Grove Street, you will find the Sturgis House 1639, the oldest house still standing. Our other immediate neighbors include John Pope 1699 and the Newcome Tavern 1703. A keen eye will note common family names of the builders/owners, including many markers around town bearing the names of different members of the Bassett and Pope Families. Our Inn was listed on the National Registry of Historic Places by the US Department of the Interior in 1975, as were the historic houses and buildings around the original center of the village at the bottom of Shawme Pond. This area was defined as the Town Hall Historic District. 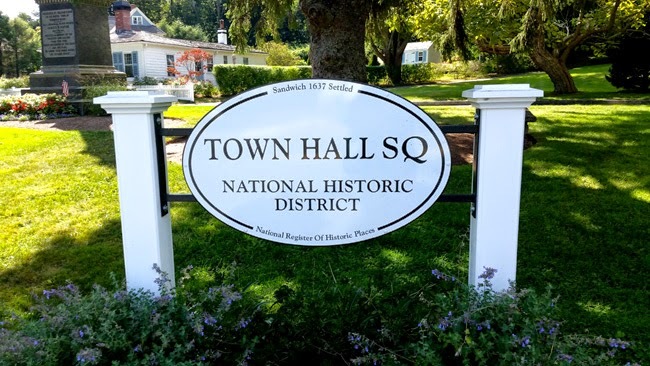 Recently, other subsections of Sandwich have gained similar recognition of their historical significance and have also been defined as separate historic districts. 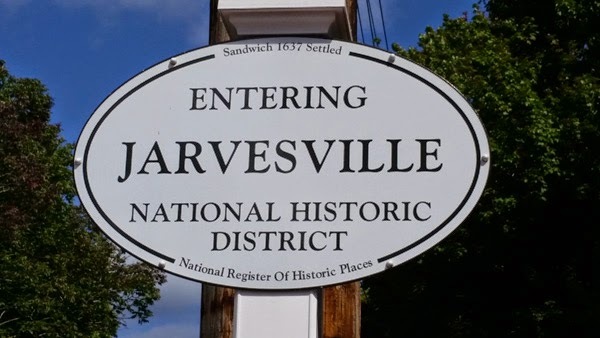 The new Jarvesville Historic District is a mainly residents built for workers at the Boston and Sandwich Glass Factory between 1825 and 1860 when Sandwich was considered the center of pressed glass production. Also, the new Spring Hill Historic District down Route 6A is a rural and residential area reflecting the area's long farming history and includes the Wing Fort House, one of the oldest wood frame houses in North America and the site of the first Quaker meeting in the New World. It is also notable for its cranberry bogs, some of which have been actively cultivated since the 19th century. New signs around town designate the boundaries of these contiguous designated national historic districts. Come stay with us and we’ll share with you all the wonderful history of Sandwich. Even if you missed the celebrate of the first 375 years of this great history, Sandwich will be showing off its historic past for many years to come. We are looking forward to the celebration of the next milestone, the big 4-0-0.